The control panel of any appliance is vital to its operation. 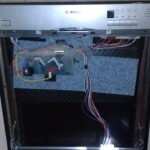 This Maytag Dishwasher Control Panel had a malfunction and needed to be replaced. Replacement control panels can be ordered from the manufacturer, in this case from Maytag directly. We ordered a new control panel from Maytag and replaced the bad control panel on this Maytag Dishwasher.